After 3 years of researching Patrick Parker and his wife Mary Murphy, I have found when they died. The marker for Patrick Parker that I previously found in Saint Mary’s church cemetery, east of Ackley Iowa, is indeed my third great grandfather. His wife Mary died on 13 Aug 1887 and was buried in the church cemetery. Her name no longer appears on a marker in the cemetery. I suspect that it once was on the same headstone as Patrick’s, but the top portion was damaged and removed. This morning I found her obituary by serendipity. I have been working my way through scans of the baptismal register for Saint Mary’s (a project I will write about soon) and came upon an entry for Stephen Patrick Parker, son of Thomas Parker and Ellen Clinton. It had a date for the baptism, but not for his birth. The baptism was in 1885, and there’s a possible match for this Stephen Parker who was said to have been born in 1888. I decided to do a quick search of the keyword Parker in the Ackley Enterprise on NewspaperArchive.com for the years 1885 to 1888, to see if I could find his birth. I have not found it yet, because I found something else. That was a brief mention that Julia Parker Kenefick had attended the funeral of her mother. It was third in my results list and was published on 19 Aug 1887 on page 5 column 3. Mr. and Mrs. M. Kenefick, of Belmond, attended the funeral of Mrs. Kenefick’s mother, Mrs. Parker, last Monday. 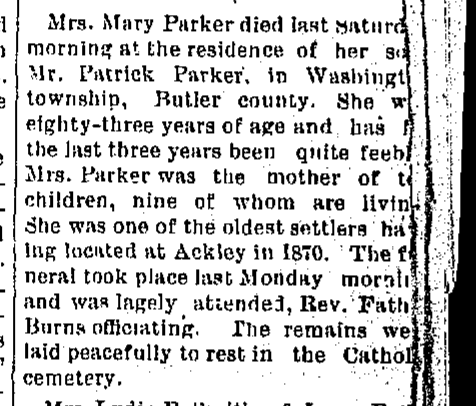 It did not come up in the search, but in column 6 on the same page appeared a notice of Mary Parker’s death. Mrs. Mary Parker died last Saturday morning at the residence of her son Mr. Patrick Parker, in Washington township, Butler county. She was eighty-three years of age and has [for] the last three years been quite feeble. Mrs. Parker was the mother of ten children, nine of whom are living. She was one of the oldest settlers having located at Ackley in 1870. The funeral took place last Monday morning and was lagely attended, Rev. Father Burns officiating. The remains were laid peacefully to rest in the Catholic cemetery. Mary Parker died 13 August 1887 at the home of her son in Washington township, Butler County, Iowa. She was buried in the church cemetery with Reverend Father Burns officiating. L.H. Burns was the parish priest of Saint Mary’s in Ackley, meaning Mary Parker was buried in their cemetery. And meaning that I have enough evidence that I will consider the Patrick Parker buried there to be my third great grandfather.